Doble has five wins in his career, the first three with Lee LeGrande and the last two with Karch Kiraly. He was part of the lowest seeded team (14th) to play in an AVP final since 1998 when he and Ryan Mariano advanced to the Huntington Beach championship, but it ended in his only loss in six trips to the finals. In 2006 he was ranked 10th in kills on the tour (10.8 per game). 2002 and 2003 were Doble's most consistent years, finishing as part of the second ranked team both seasons (with Kiraly). In 2003, he had top five finishes in all nine events including one victory. In 2002, he had six top five finishes in seven events and a victory. In 2001, he picked up two victories with LeGrande at <?xml:namespace prefix = st1 ns = "urn:schemas-microsoft-com:office:smarttags" />Muskegon and Belmar. 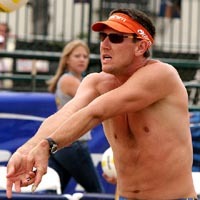 Teamed with LeGrande to win the 2000 AVP season opener in Delray Beach, Fla. In his beach career, he has played with five different beach Olympians, including two Gold Medalists.